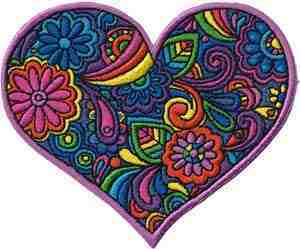 This super psychedelic patch is sure to capture the heart of any hippie in your life. This patch features a multitude of colors in paisley print and flowers everywhere; and a soft pink boarder that pulls it all together. This patch measures approximately 3.5" x 3.75" and is iron on adhesive.